Extra large men's costumes can be hard to find. Choose your plus size men's costume for Halloween at SpookShop.com. Extra large Devils, Vampires, Ghouls... plus size zombies, creepy doctors, or the headless Horseman (great for tall men), and many more XL costume ideas. It's a full moon! Haunt the darkness. Beer Keg costume. Now available in "tallie" versions for the larger drinkers. Check your vital organs after this one's done with you! Zombie Attack! Scotland, aye! Your prescription is ready Bottom's up! To infinity and beyond! I'll stay with my ship To infinity and beyond! Live long and prosper. 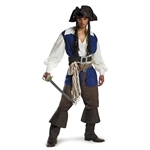 Deluxe Blackbeard Costume Theatrical Jack Sparrow Costume I AM an ogre!